← What is APA Style? Working on a long paper such as a proposal, dissertation, or an article for publication or conference? Planning to use the summer to start/work on/complete major writing projects? Sign up for a monthly summer writing group. Francesca Gacho, the School of Communication Graduate Writing Coach, will be available to guide the writing session, provide tips for best practices, and provide brief one-on-one consultations as needed. Writing groups are comprised of 4-6 people who meet regularly to write and establish sustainable writing habits. The group meets once a month for 3.5 hours (two 1-hour writing blocks with two 15-minute breaks and a 30-minute peer review/check-in). Students will receive training in best practices for running a successful writing group and additional support from the Graduate Writing Coach. Writing groups work best for students who are starting to write or in the process of writing long-term projects. The group will meet on the following proposed dates June 20 (Tuesday), July 20 (Thursday), and August 10 (Thursday). Times are TBD. Joining a writing group is a great way to establish a writing schedule, gain a sense of your own work/writing habits, and manage writing projects in a practical and efficient way. 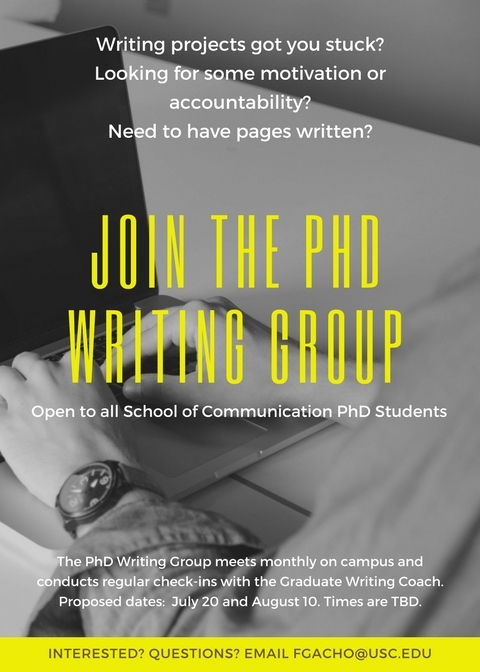 The Writing Group is not intended for group or individual tutoring sessions with the Coach, though the Coach will be available for questions. The Writing Coach will also assist in securing a classroom for the group. Snacks and refreshments will be provided. Interested? Click here to sign up. Open to Annenberg Communication PhD students only.